LAS VEGAS - There were some terrifying moments on a Frontier Airlines flight moments after it took off from Las Vegas headed for Tampa, Florida. 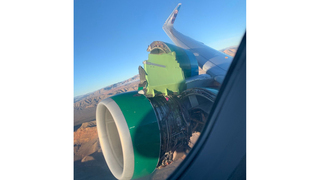 Passengers snapped pictures when the engine cover came loose during the take off from McCarran International Airport Friday morning. Frontier Airlines says the pilots turned the aircraft around and safely made an emergency landing back at McCarran. No one was was injured but many passengers had their nerves rattled. C.J. Gunnerson recorded a flight attendant during the pre-flight safety announcement unaware of what would happen minutes later on flight 260. "I fell asleep just after that during take off. And then I woke up to a group of 10 or 12 people on the right side of the plane just standing up screaming, 'Stop the plane stop the plane' and we had originally thought somebody had a heart attack," Gunnerson said. Gunnerson and his best friend, Kris Stamps, are from Colorado. They had a layover in Las Vegas on their way to Tampa, Florida but never made it. During take off at McCarran international airport the engine cover, known as a cowling, came off... sending passengers into a panic. "I finally get a glimpse of the view because we were on the left side of the plane and it was the right motor and could just see hydraulic lines there and I was like hey you're not supposed to be able to see those things, that's not good," Stamps said. The 4-year-old Airbus 320 had 166 passengers and crew members on board. The website, flight radar 24, shows the aircraft's path after a taking off at around 7:15 in the morning. Gunnerson and Stamps say they circled for a short time then landed just before 7:30 a.m.
"We never heard anything from the pilot but we heard from a flight attendant that you know that both engines were working and we were just waiting for our opportunity to land," Stamps said. The best friends say passengers were given a $10 food voucher. They say some were able to get on other flights but the duo decided to stay in Las Vegas courtesy of Frontier Airlines. "Not too bad to get stuck here," Stamps said. Nevada Governor Steve Sisolak is making good on a campaign promise to donate his salary to education. His net salary will be donated to the Nevada Department of Education's Education Gift Fund and distributed to each of Nevada's Title 1 schools to pay for the purchase of necessary school supplies needed for instruction. Title 1 schools have larger percentages of economically disadvantaged children. In San Jose, the game will always be remembered as the Pavelski Payback for the four goals scored on one power play after the Sharks’ captain was knocked out cold, turning around a wild Game 7 that finally ended in overtime. The Sharks responded to the bloody injury to captain Joe Pavelski by scoring four goals on the ensuing power play and then bounced back after allowing the game-tying goal in the final minute of regulation to beat Vegas 5-4 on Barclay Goodrow’s goal 18:19 into overtime on Tuesday night. NEW YORK (AP) - Sin City? More like Sting City. Mary Wilson is still "Supreme"